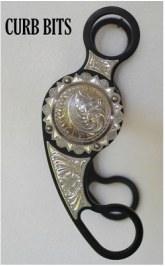 For the horsemen who have prepared their mounts to advance past the hackamore and snaffle and into a bit we offer several nice styles. We have two basic types of bit design--Curb Bit and Bridle Bits. All Gene's bits are blued steel with sweet iron mouthpieces and all feature his fine sterling silver hand engraving. We're sure you'll appreciate the artistry and workmanship that goes into each one. Curb bits are generally considered versatile all around bits useful on just about any horse past his early training. 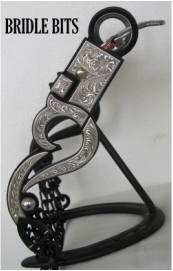 They come in all styles and are commonly made for split reins. Most of Gene's curb bits can be ordered either swivel jawed, having generous rotation at the cheek, or solid jawed often times referred to as stiff bits. Bridle bits are designed for the more finished and experienced horses. They can come with solid rein rings for split reins or swivel connectors with rein chains, reins & romal. They might have a cross bar connecting across the bottom of the bit or they might have cross chains instead. They can be solid jawed or loose jawed. You'll find just about any style featured here.